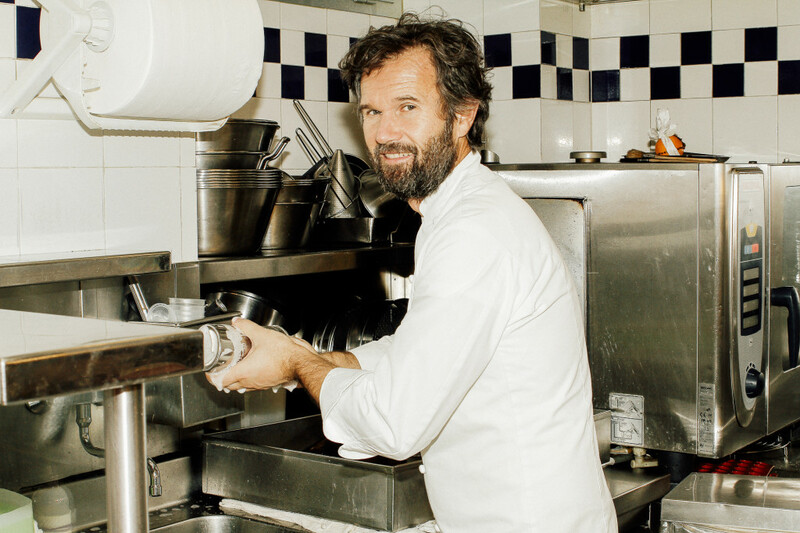 World-famous chef and burgeoning TV personality, Carlo Cracco’s journey began in Italy in 1965. A love of food drove him to study at the Pellerino Artusi institute of hospitality management in Veneto, before heading off to Venice to work at the restaurant Da Remo upon graduation. In 1986 he began to collaborate with Gualtiero Marchesi – which was a turning point for his career. 3 years in France studying of French cuisine followed, before returning to his homeland taking up the position of chef at the Enoteca Pinchiorri in Florence. That place awarded 3 stars Michelin Stars. Further collaborations with Marchesi followed – this time working in latter’s newly opened restaurant L’Alberta in Lombardy as chef for 3 years, after which he struck out on his own and opened his own restaurant: one Michelin Star. The owners of the Peck Marketplace in Milan then reached out and a new restaurant was born: Cracco Peck, which is one of the places Carlo can be found today as Executive Chef. Since 2007 though, the restaurant is known as just Cracco. As of 2014, he also owns the Milan bistro Carlo e Camilla in Segheria. 2011 witnessed the birth of Carlo Cracco – TV star, where he took the hosting reins on MasterChef Italia as well as going on to host the first two seasons of the Italian version of Hell’s Kitchen. Blue eyes, black hair. A classic pointy nose, and standing over 6ft tall. This is a man and a half. Who is the figure…? An actor? Nope. This man who can take many a lady hostage with just his eyes is Italy’s most famous contemporary chef: Carlo Cracco. His status in Italy is along the lines of fellow Hell’s Kitchen presenter and chef, Gordon Ramsey. Both have notched up some Michelin Stars for their own restaurants; both are not strangers to the TV screen. Both offer something different; both create food in their own unique ways. But, more than anything, I have to say – if it is at all possible – the real-life Carlo is even more dashing than on the TV. I often wonder which country I prefer: Japan or Italy? But when I see that Italian style, machismo and charm that Carlo wears like coat, it just clinches it for Italy. Then he opens his mouth and out comes the country accent from his home region of Veneto. If anything, it just adds to his humanity and approachability. Take me now. On the other hand, while he does have that familiarity you expect from a Big Star, he does have the slight reputation of being difficult individual. When it comes to food, he is known for his contemporariness of his cuisine, but on the decorative front he keeps it simple. Simple ingredients, arranged ingeniously that surprise his customers. Eggs are a particular specialty. His creations emit warmth. The stuff you ate 3 years ago and still remember today. That’s a Cracco dish. His restaurant lies just a 5 minute walk from the Duomo in central Milan. Recently opened, the bistro Carlo e Camilla in Segheria is one of my favourite restaurants. 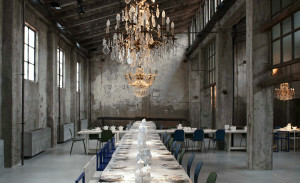 The restaurant may conjure up memories of the Palais de Tokyo in Paris, but is, in fact, in the site of a former factory. A tall ceiling stands above the concrete walls – still in place. The chandelier overhead oozes class. The building itself remains as it was; just two long tables dominating the centre space have been added. It’s a table setting that could have easily sat The Last Supper. But with Richard Ginori teapots that function as table numbers. SaraWaka: Ciao, Carlo! I’ve been tracking you down for 2 years – thanks so much for granting me this interview finally. Tell me everything! Carlo Cracco: Where shall I start? Sara Waka: Right at the beginning. From your birth. Carlo: You’re joking right!?! This interview will take 2 days in that case? Do you really have the time!? Sara Waka: Two days is maybe a bit long… let’s go for a shortened version. Not the Twitter version – somewhere in between 140 characters and two days please. Carlo: I became interested in food relatively late. I didn’t really have the interest when I was younger. But I did love to eat beautiful things. Probably why I was so chubby! Sara Waka: You were chubby?! Italian Cuisine Hunk-of-the-Year Carlo was chubby?! The housewives are fainting at this news. Carlo: It’s true. That’s why when I was 10 my mum put me on my very first diet! I was shocked. I still love to eat though. That was probably the start of my relationship with food. Then I went to study hotel management. Sara Waka: Okay. I guess if hotels are involved, there is no trouble continuing to eat, right. Carlo: Exactly! I actually wanted to become a bartender, but I had to work on the floor and began to think if that’s the case I’d rather be working in the kitchen. And when I did, my grades began to improve, and I began to really become interested in food. I bounced around to various restaurants in Milan, Monte Carlo, Paris and Venice, but more than anything it was meeting Guatiero Marchesi that gave me the push. Then once I had the experience, I started my own restaurant in Alba up in Piemonte. After 4 years, I really wanted to move back to Milan, and got a call from Peck, the famous quality grocers, and we started working together. So for 15 years, I worked just close to the Duomo in a restaurant called Cracco Peck, before starting my own thing in 2007 called Cracco. Sara Waka: There’s always been a sense of competition between Italian and French cuisine. What does French cuisine mean for you? Are you influenced by it? Carlo: Of course I am influenced. I have had some chances to work with the top chefs in France. I’ve worked with Alain Ducasse, Lucas Carton, learnt so much from both. That probably really established the basis for my philosophy when it comes to food. When I think back, it comes from the avant-garde French cuisine of that time. Sara Waka: You were influenced by the avant-garde back then? You would not think of such things from an Italian! On that note, I saw some nori [ed: Japanese seaweed paper, wraps around sushi] in your kitchen; are there any influences from Japanese food? Carlo: Ha! Are you some kind of spy?! But yes, I do like Japanese cuisine, and even more like the respect that Japanese people have for each individual ingredient. Treating them with a lot of importance, very detailed, almost to a maniacal level. Ingredient by ingredient. The fact that it has become an artform is impressive. In terms of treating all components with importance and letting each one breathe individually, I think it is similar to the philosophy of Italian cuisine. Holding back on the sauce, letting the individual flavours stand on their own. In terms of differences, visually Japanese cuisine is compact, whereas Italian has the pasta spread out and more homely. Both are different cuisines obviously, but even within that there are similarities, and within their mutual simplicity lies a certain beauty. Sara Waka: I realise that you are not actually praising me, but you saying such things makes me very happy! Carlo, you’re very popular with housewives and the ladies in general. But which do you prefer, working on the TV or working in the kitchen? Carlo: Sara, you exaggerate! Until recently, the level of interest in Italy towards the good food industry was fairly weak. The medium of TV has played an important role in bringing a variety of people to the industry. I am very happy that the programmes I am on – MasterChef and Hell’s Kitchen – have brought me to the attention of many women… and men and even children. Previously, the people who ate this type of food was a very small, limited group. Until recently, recipes were held back as trade secrets and the industry was very closed, but thanks to television the level of knowledge has increased nationwide, and it has opened up. Many people now know the different types of salt, or meat cuts, or cooking methods. This is one of the benefits of receiving media focus. Sara Waka: So true! Italy is different to Japan in that your average person is not really interested in food. In Japan, when you turn the TV on you’re pretty much guaranteed to find some food programming. Changing topics: Carlo, you’re interested in art as well, correct? You’re good friends with Maurizio Cattelan, right? Carlo: Yes, I know him well. He is truly a walking imagination. His way of thinking is very original and is an artistic genius when it comes to vision. I think art is the most beautiful expression. Cuisine is a form of art too, but my favourite form of what can be termed art is probably music. Sara Waka: Really! What type of music do you listen to? Carlo: Wide-ranging, from classical to more contemporary sounds. Melodies that really move your core emotions. And in those moments, what you realise is that not everything in life can be fully explained. The true beauty of living is not understanding everything with your head. It’s feeling. Sara Waka: [her eyes brimming with respect] Carlo… thank you so much for today. I feel as if I have had a snapshot of what lies behind the kitchen’s door, and you have told us so much – thank you again! I’m getting hungry as well… having enjoyed the sight and sound and smell of Carlo, would it be possible to add the taste of your food too? Maybe a casual touch as well just to round off the 5 senses. Carlo: Of course. This way if you please, madam.